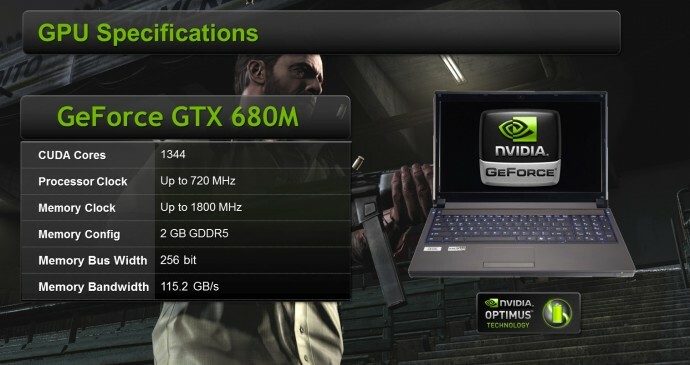 The new top model mobile GPU based on the Kepler architecture from Nvidia has been officially announced – the GeForce GTX 680M. The new GPU marks a very significant improvement in terms of performance compared to the already announced Series 600 mobile GPUs based on Fermi/Kepler architecture as well as compared to the previous top model – the GTX 580M. The GeForce GTX 680M comes with 1344 CUDA Cores, up to 720 MHz GPU clock and with 2GB GDDR5 at up to 1800 MHz video memory and 256-bit memory bus. The previous top model GTX 675M was Fermi-based and comes with 384 CUDA cores much like the GTX 580M. According to Nvidia the new GTX 680M is up to 80% faster than the previous-generation flagship model, the GTX 580M in terms of performance that you get, making it an ideal solution for gamers and especially for gamers willing to play in stereoscopic 3D mode on a laptop using 3D Vision. In fact the GTX 680M offers very similar specifications to the desktop GTX 670 GPU and the performance you get should be very similar as well, all that within a TDP of about 100W (according to unofficial information). The first laptops to feature the new GeForce GTX 680M GPU along with 3D Vision 2 support and a 3D-capable display would apparently be the Alienware M17x that would be available with either Nvidia Optimus technology or Nvidia 3D Vision technology as an option. Sadly having both Optimus and 3D Vision support on a single laptop is still a problem due to the way the Optimus tech works together with the integrated Intel graphics processor. They should either fix Optimus to work with 3D Vision and other nVidia technologies, or just scrap it. Optimus is too much of a headache. The 680M has just over half the memory bandwidth of the 670GTX so unfortunately it will not be anywhere near the performance of it’s desktop counterpart.